Self-fertile - you won't need another variety for pollination. Produces heavy crops on a very short compact tree. Easy to grow in big pots and tubs, or direct in the garden. 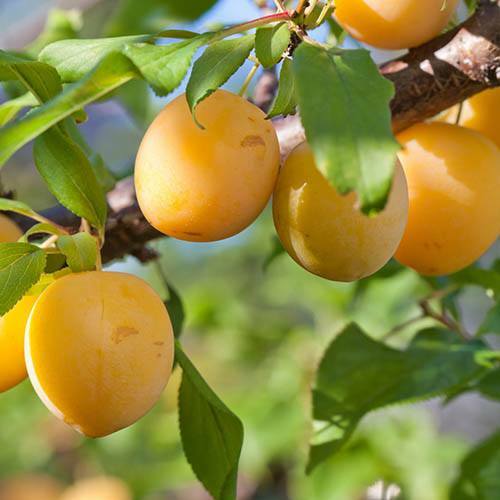 Plum GoldDust is the amazing yellow fruited self-fertile Plum from the famous Zaiger patio fruit breeding program from California, producing heavy crops of golden yellow plums, yet on a very short compact tree. GoldDust is compact, and will remain below 1.8M (6ft) for 10 years or so, and is easy to grow in big pots and tubs, or direct in the garden, in a sunny spot, where the suns rays can ripen the fruit and convert as much sugar as possible for the sweetest taste.